Downtown Atlanta, "New and Old"
The other day I was on a tour with a visitor from England who commented on what we Atlantans consider an "historic" building. She was referring to the Swan House, built in 1928. OK, so 1928 wasn't that long ago, but we're a young country and Atlanta is an even younger city, especially considering how much of the city was burned during the Civil War. Remember, we're called "The New South," so a lot of the surviving antebellum (pre-Civil War) buildings and artifacts are indeed "historic" to us. 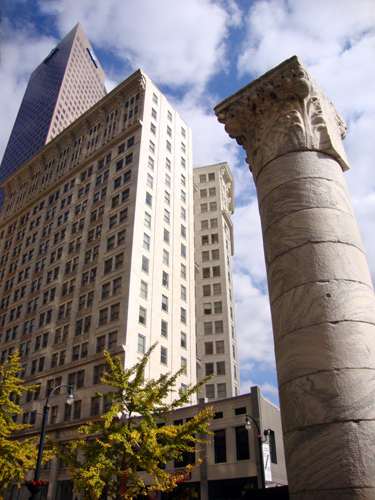 This weekend is the final three days of the Atlanta Preservation Society's Phoenix Flies program and there are several tours that visitors and locals can still take advantage of, including an Historic Downtown Walking Tour. Check the Phoenix Flies website for available days and times and remember that some of the tours require reservations, some do not (most of the walking tours do not). It's going to be a gorgeous weekend so get our and explore our beautiful, new (and historic) city. I'm doing St. Pauls in Grant Park tomorrow and Meadownook on Sunday if all goes well. The Equitable Building Plaza (where your picture is taken from) is an amazingly good place. Folks naturally hang out there. Atlanta Botanical Garden: Atlanta Blooms! Museum of Design Atlanta: Italian Motorcycles! ATLANTApix: Want to be on TV at the Fox?